The feature is available only in Yahoo mail Beta. 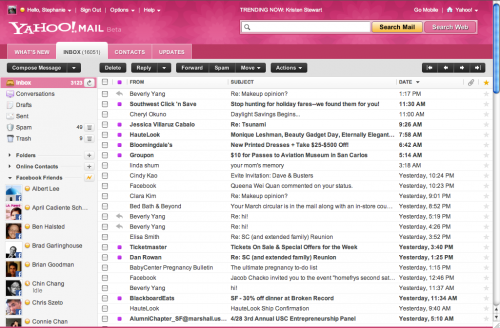 So, if you are using old Yahoo mail interface, its time to switch to Yahoo Mail Beta. Login in Yahoo mail and make sure you are using Yahoo mail beta interface. On the left, you’ll see “Facebook Friends” under “Online Contacts”. If you click on the thunderbolt, you will be prompted to authenticate on Facebook Connect (if you haven’t already). Once you’ve authenticated, your online Facebook friends will appear below “Online Contacts” and you can chat freely.